Last year my youngest daughter took up the trumpet, and shortly after she started she managed to get the mouthpiece stuck. This is pretty common, from what people in the know tell me. 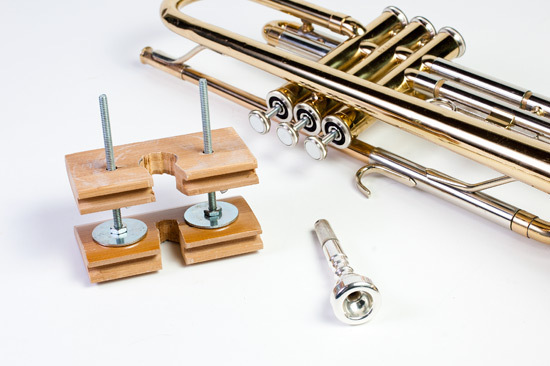 The problem is, the school used to have a mouthpiece removing tool, but it either broke, or it no longer has it, which means I had to take it in to the music store, get a loaner, wait for the repair, and then go pick it up and return the loaner… Hassle! 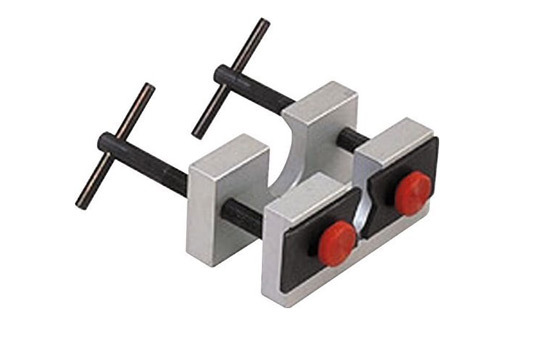 Pictured below is what a mouthpiece puller looks like. There’s also a more tooly/clampy version, which is the only kind I had seen at the time. After she got the mouthpiece stuck a second time (!?!?) I wondered if I could make my own tool, and it turns out I could. It actually looks very similar to the commercial version above, even though I didn’t see that one until I started writing this post. I was using screws between wood for another project that needed an adjustable platform, and I borrowed the concept for this. I originally put calipers on the mouthpiece to get the right size, and then drilled holes into the two pieces of scrap bamboo I had. At that point the project sat dormant, waiting for the mouthpiece to get stuck again… which it did a few days ago. I ended up making some very inelegant rough cuts into the bamboo with my jigsaw, and got it so the thing would slide into place semi-tightly, and then started turning the wing-nuts to apply pressure and force the mouthpiece off. It was tricky! I didn’t want to apply too much (I am not a professional band instrument fixer!) but when I thought it was all the way, I tried twisting it slightly. I don’t think twisting it works at all, and in fact I think it’s the wrong thing to do, because of the possibility of damaging the instrument. (Again, I am not a professional!) So with just a little more turning of the wing-nuts, it popped off! I was quite pleased, as this meant I didn’t have to make two trips to the music store, and my daughter would have a trumpet she could put back into the case again. Two more things… If I designed a trumpet case, I’d add some sort of special door to the side so you can put the damn thing in the case when the mouthpiece is stuck. 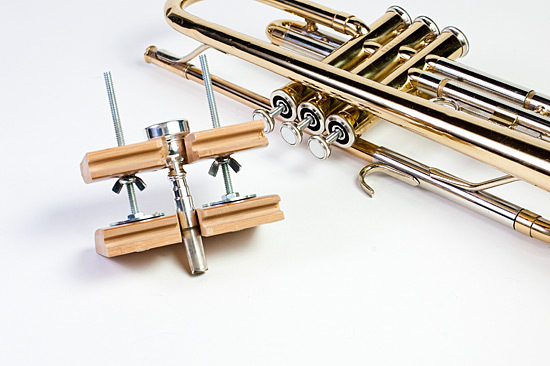 I know this might encourage people to not take out the mouthpiece, but it’s no fun carrying around a trumpet with a stuck mouthpiece and the case it won’t fit into. The other thing… Every school that has a band program should have one of these. Heck, if there are at least 3 other kids playing trumpet, I’d see if they could all pony up $10 each to supply the school with one. Even if a band director couldn’t remove it every time, it would be a good first line of defense. Posted on Tuesday, April 24th, 2012 at 12:52 pm. Subscribe to the comments feed. Both comments and pings are currently closed. Post on your own blog. BTW Sean Malloy’s girlfriend is a brass instrument tech, she could probably answer any questions you might have. I played Trumpet in Jr. High and never had a stuck mouthpiece. Just about all the other bits got stuck at one time or another though.